Biography of Irish Art Collector, Founder of Hugh Lane Gallery, Dublin. Founder of the Hugh Lane Gallery. Born in County Cork - his father was a rector, his mother Adelaide was a daughter of Dudley Persse, of Roxburgh, Co. Galway and a sister of the dramatist Lady Augusta Gregory of Coole, Co Galway - Sir Hugh Percy Lane started out a delicate boy and received an informal private education at the family home in Cornwall. In 1893, at the age of eighteen, he joined the London art dealers Martin Colnaghi as a trainee painting restorer. After this, he joined Marlborough Galleries for some years, before setting himself up in London as a "gentleman art-dealer". By all accounts, Lane was a gifted connoisseur of fine art and his keen eye for a painting soon brought him spectacular success as well as a considerable fortune. Among other things, he became an expert on Impressionist paintings, and helped to enhance the collection at the National Gallery in London, where he was a director. He was also a great admirer of his Aunt, Lady Gregory - particularly for her support of the Irish cultural revival at the turn of the century. As a result, he himself decided to do something for arts in Ireland. Over the next few years, despite being one of the busiest art dealers in London, he spent endless time and money supporting fine art in Dublin, by raising funds and by acquiring and donating works to the city from his own collection. He began by commissioning the eminent portraitist John Butler Yeats to paint portraits of distinguished Irishmen - a task completed by William Orpen after Butler left for America. Meantime, to raise funds to enable Dublin to start an art collection, he put on an exhibition of Old Master paintings at the Royal Hibernian Academy in 1902, and two years later staged a major exhibition of nearly 500 paintings by Irish artists at the Guildhall, London, followed by a show devoted to modern art (including Irish art) at the RHA. In all this, he made full use of his circle of influential friends including his aunt Augusta Lady Gregory and WB Yeats (founders of the Abbey Theatre), Douglas Hyde, Edward Martyn, and the portraitist Sarah Cecilia Harrison - to whom he later reportedly became engaged. In addition, he began to amass a large collection of valuable paintings, which he donated to Dublin Corporation, on condition that a permanent gallery of modern art was established in which to show them. While awaiting the appearance of such a gallery, the collection was displayed in Clonmell House, Harcourt Street, Dublin, which opened its doors to the public in January 1908. Lane was honoured as a Freeman of the City, receiving a knighthood the following year. The collection he gave to the city of Dublin actually amounted to 300 works and was described by Le Figaro newspaper in Paris (20 March, 1908) as an "entire museum rich in beautiful works, a museum envied by the most prosperous states and the proudest cities." Anxious to speed up the building of the new gallery, Lane asked the eminent architect Sir Edwin Lutyens to draw up plans for the project. Lutyens happened to be one of the most gifted English architects of the day, having designed several prestigious buildings and war memorials, including the Cenotaph in Whitehall, London, the moving Memorial to the Missing of the Somme at Thiepval, France, and the Islandbridge War Memorial in Dublin. He had also virtually designed the city of New Delhi, in India. Lutyens duly produced several dazzling plans, including one which involved a colonnaded structure in St Stephens Green (opposite the Royal College of Surgeons) as well as another design for a highly innovative "bridge gallery" over the River Liffy. Unfortunately, in time-honoured fashion, local Dublin architects were outraged that such a prestigious building should be designed by a foreigner, causing the exasperated Lane to write (in a letter to his Aunt): "I hate the place, the people, and the Gallery." While all this was going on, Lane also acted as a consultant in the foundation of the Johannesburg Municipal Gallery of Modern Art founded by Lady Phillips (1909), which helped to establish the Cape Town National Gallery's Collection of 17th Century Dutch paintings (1912). In the Spring of 1915, with still no sign of a gallery being built to house his donated collection, Lane visited America, where he sold two of his most important paintings (Man in the Red Cap, by Titian, and Portrait of Thomas Cromwell by Hans Holbein) to the American art collector Henry Clay Frick. On his return to England he sailed on the SS Lusitania, and drowned when the ship sank in less than 20 minutes after being torpedoed by a German submarine at 1410 hours, on May 7 1915. He was one 1,924 souls who perished in the tragedy. Even this did nothing to expedite work on the Dublin gallery. Finally, in 1933, after some 25 years at its temporary base in Harcourt Street, the Dublin Municipal Gallery of Modern Art (later renamed the "Hugh Lane Municipal Gallery of Modern Art", now called "Dublin City Gallery The Hugh Lane") moved to fine premises at Charlemont House, Parnell Square, Dublin. Until the foundation of the Irish Museum of Modern Art in 1991, the Hugh Lane gallery was the home of all modern art in Ireland.  For more about art buying/collecting, see: Homepage. 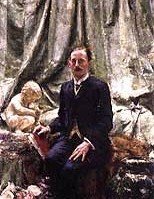  For more about art collectors in Ireland like Hugh Lane, see: Irish Art Guide.